Each year, Valentine’s Day sales reach an average of $13.19 billion. Know about valentine statistics here. 1. Think Mobile – Mobile is fast and preferred shopping channel in leading ecommerce markets like the Asia and USA. With 70% of customers saying they’ll denied a mobile purchase if the site isn’t fully responsive, you would do well to make this a priority during peak sales periods like Valentine’s Day and other celebrations. Ensure your messages are adjusted to mobile viewing, and that the move from email to website to checkout is consistent. In the event that your website isn’t versatile responsive as of now, make that first on your rundown of things to do to get prepared for the sales season. 2. Offer Attractive Deal – Similarly as with other deal periods, the challenge at Valentine’s Day is to think of an offer that emerges from the crowd. Shippers who offer customary Valentine’s Day merchandise like blossoms, chocolates, squishy toys will be under excellent pressure to catch the consumer attention. Discounts are an obvious option, but playing on price alone can be hit or miss. To execute the any offer or deal on your Prestashop store, just download an extension which will give you countdown timer option for particular deals. It works like a watch, just run your offer according your deal time. One extension for your Magento store is “CUSTOMIZABLE PRODUCT DESIGNER”, Product Customization plugin allows the user customize the available products in the online marketing stores. Customer can modify the product using various options like clip arts, fonts, multiple sizes, and uploading custom images. This provides the end user to get variant add-ons on the product of his choice. Pop Ups or Pop Ins – Pop-ups and pop-ins promote your deal to individuals who are as of now on your website. Since they take up your whole website page, they’re certain to catch customers’ attention– yet they can likewise be seen as disruptive. Email Marketing – Email marketing, one of the most impressive methods of getting your message out: you reach specifically into your client’s inbox for an opportunity to get their consideration and direct people to your website. Must Remember, you have an catchy subject line to attract the users and customers. 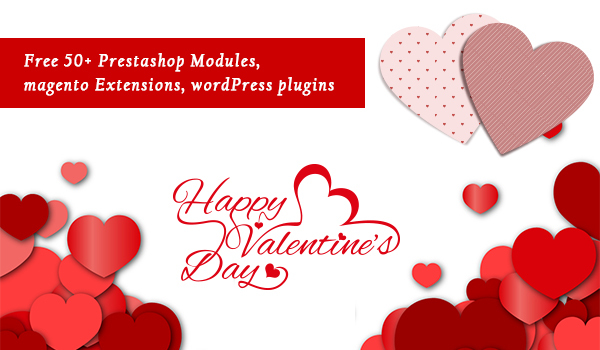 Think about how you can glad your customer this valentine, in addition to saving his/her money. Google Ads – Display Google ads, one more effective way to increase traffic. Through Google ads, you can display your products by banner, must to go with this if you have some attractive deals and sales like 80% OFF, One plus One offers etc. You manage your campaign ads directly with Google Adwords, or use a 3rd party service provider, but you’ll have to pay to use this option. Around holiday sale, bids for keywords like sale, discount products, valentine day gifts tends to be higher. Google Ads can be a great boost, but if you don’t have a attractive deal or give customers a reason to trust you, then no amount of traffic will help you reach your sales goals. Social Media – Social media also the very effective and easy way to grow your sales and great way to reach customers who are interested but haven’t made a purchase with you. You might consider a social-only promotion or contest to drum up interest. Do you know you plan on promoting your valentine’s day sales? For more help and advice, check out our Google adwords services and Packages! 4. Test – With a restricted time to change over clients, it’s vital to test your site and the offers that you’ve created. Ensure the coupons and advancements you’re advancing really work: it sounds obvious. Test destination URL from all your advertising. Try placing an order and check all process is ok. Complete the order with each of your payment options. Valentine’s Day is a major one for last minute orders, so it’s more critical than any time in recent memory to ensure quick and easy ordering. 5. Analyze –Last, but certainly not least: scheduled post-holiday sales analysis. Use this time to review your sales predictions and to see if the sales met or fell short of your target goals. Which trends would we follow for the next sale? Which trends were surprising the customers? Anything Rest to test, If any should we stop testing?